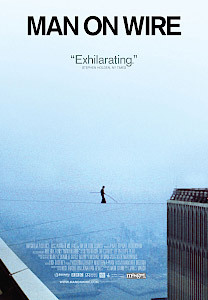 Man On Wire (2008, Director: James Marsh): Winner of both the Grand Jury Prize: World Cinema Documentary and the World Cinema Audience Award: Documentary at this year’s Sundance Film Festival, James Marsh’s stunning film brings an inexplicably obscure story to life in a fresh and exhilarating way. On August 7, 1974, a young French wirewalker named Philippe Petit spent 45 minutes suspended on a wire between the two towers of the World Trade Center. He made eight crossings before the police convinced him to return to safety. Though this story, according to the director, is part of New York City folklore, not many people outside the city seem to know anything about it. But what a fantastic story, and Marsh does a masterful job in telling it, mostly by letting Petit and his companions bring it to life. Petit is a fascinating figure. An accomplished juggler, wirewalker, and pickpocket(! ), he had supported himself since his teens by working as a street performer. A born storyteller, he brings the narrative alive, even almost 35 years after his great “coup.” But best of all, Marsh gathers all Petit’s accomplices as well and has each of them recount their own part in the story. Some were steadfast, like his lover Annie and his childhood friend Jean-Louis, and others fickle and cowardly, like Americans David Foreman and Alan Welner, who both abandon the quest at the crucial moment. All tell their stories candidly and all still seem enveloped in wonder that such a thing could be accomplished. Of course, it would be impossible to see a film featuring the Twin Towers without thinking of the events of 9/11. Marsh wisely avoids making any connections, letting the footage of the buildings’ construction speak poignantly for itself. Petit’s feat seems even more wondrous when you consider that the fragile Frenchman survives while the mighty towers lie in ruins. UPDATE: Mongrel Media will be releasing the DVD of the film in Canada on Tuesday December 9. This entry was posted in Documentaries, Film Festivals, Hot Docs and tagged #hotdocs08, newyorkcity, nyc, worldtradecenter. Bookmark the permalink. The film is breathtaking to watch. I was nervous for Petit out on that wire and found myself gasping on more than one occasion. Although I knew nothing happened to him accident-wise (he is, after all, narrating the story), I couldn’t help but think he would fall or injure himself. 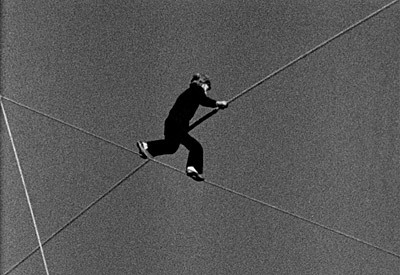 It’s insane to watch someone walk on a cable with a sense of balance that is, for most humans, impossible. But maybe that’s the key: Petit is ethereal, graceful on that cable. The wire is as natural to him as the sidewalk is to a mere mortal. There is a comedic element to the storytelling of this film that makes that makes it an outstanding film for me. Petit recalls a ‘keystone cops’ moment when he played hide n’ seek with a policeman on the roof of one of the twin towers. The policeman never knew Petit was there and the way in which Petit describes the moment, you almost feel like you are on the roof with him, hoping you don’t get caught. James Marsh introduces the players in this prank as if they were in the SuperBowl — dramatic lighting, lingering head shots, smiling directly at the camera, over the top, funny. There are many funny moments that make this an enjoyable film and in a strange way, a celebration of the twin towers. A must see for any documentary film fan. The sheer mechanics of this stunt are enough to get me to watch the film – how, exactly, does one casually run a cable between the twin towers? I hope it will get to Toronto soon. This one deserves a huge audience.